The Parent Water Cooler - this open board has collected over four thousand pins from parents just like you. With more than sixty parents who have contributed so far, it is open to any parent who has a pin they think would help out parents on topics such as teaching children gratitude, crafts and projects, humor, and family. Parenting – Jen Plummer - not all advice has to come from the experts, or have solutions to specific questions. Sometimes simply being inspired can help. This board is a collection that pinner Jen Plummer put together of everything she wants to remember to tell her children when they are teenagers or adults. These pins are great for reminding us about what is important about parenting. Parenting – Terri ~ Creative Family Fun – Sharing great ideas is what Pinterest is all about, and pinner Terri has found a lot of them. With pins about picky eaters, sleeping habits of children, ways to deal with digital gadgets, and more, this board can help parents find answers to many of their parenting questions. Her pins deal with topics such as stress in children, helping them deal with their emotions, how to parent without the fight, and enjoying activities as a family. Parenting Tweens/Teens - Kathryn Bettisworth Henner – the tweens and teen’s age group can be especially challenging for digital parenting. The issues that tweens and teens deal with today, such as cyber-bullying, social media sites, and texting can all be as confusing to parents as it is to the kids. This board has numerous pins to help with those issues. Teen/Tween Parenting – Tammy Munson – a parent can never have too much insight when it comes to these difficult ages and pinner Tammy Munson has put together an awesome board to help parents navigate the stormy waters of digital parenting with her board for parents of tweens and teens. Parenting a Tween/Teen – Kathy Hannen – sometimes finding the right words to say your teen or tween can be hard. It may seem that communication with them becomes impossible. Pinner Kathy Hannen has a fantastic board full of pins that can help you as a parent find the right words to say to your child in many difficult situations. Parent Tech - UP – digital safety isn’t just for tweens and teens anymore. It seems that kids are dealing with technology younger and younger. While this may help them get ahead in the future, it also increases the risk today. This board can help with digital parenting of the younger kids. Digital Citizenship – Tceo iLibrary – digital parenting isn’t just about keeping our children safe; it is also teaching your child to be a responsible digital citizen. The resources on this board can help parents guide their children to become responsible digital citizens. uKnowKids – one of the best tools of cyber safety a parent can have is information. Digital parenting requires parents to be up to date on the latest information about keeping their kids safe in the digital age. Our board covers a wide variety of digital devices, news stories, how-to information for parents, as well as helpful tips and tricks and all the resources and posts we publish. 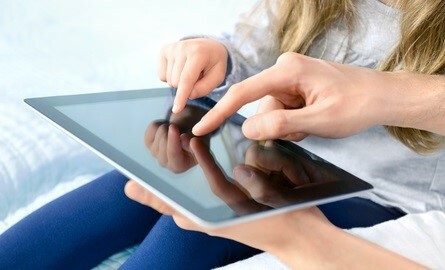 Keeping up in a world where technology moves faster than your kids can grow can be a challenge. However, digital parenting doesn’t have to feel impossible. Using Pinterest to find information such as these ten boards have can help give you the information edge you need to stay ahead of your kids in the digital era.